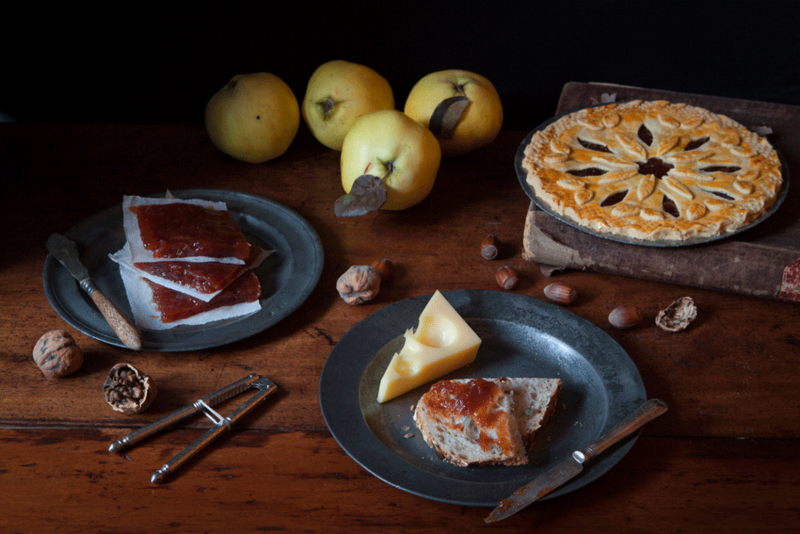 Quince and quince cheese was popular all over Europe since Medieval times. In Spain they call it ‘Membrillo’, in Italy ‘cotognata’ from the Italian word for quince ‘mele cotogne’ quince apple, the French call it ‘cotignac’ or ‘paté de coing’ from the French ‘coing’ for quince. Quinces are responsible for the word marmalade as their Portuguese word is ‘marmelo’ and they were made into fruit cheeses named marmalades. Not only quince are used, every type of plum works great too. The Spanish love it with Manchego cheese, others prefer it with sweet cheese curds, but I prefer a good blue cheese like Stilton – the king of blue cheese, Shropshire Blue or Devon Blue. Recipes for fruit cheeses are plentiful in historical cookery books. It was common to add red sandalwood or cochineal (a red colouring made from the cochineal beatle) to food to enhance the colour. Cochineal, also known as Carmine, was particularly popular in the Georgian and Victorian era but also in Tudor times the colouring of food was a very common practice in the kitchens of the King. Cochineal wasn’t only used to colour food, it was also used as a textile dye and more recent to give make-up like red lipstick its beautiful red and pink colour. (Since I’ve been wearing red lipstick for half my life I’ve probably eaten quite a few of these little cochineal bugs). I have a small batch of the dried beetles sitting in a jar in my kitchen now, ready for making cochineal. I own a small Victorian Cochineal bottle and it is quite amazing to see the dye has not lost colour all these years. That must be the reason cochineal is considered the best red dye. In Italy the cochineal bugs are used to dye Alchermes, a liqueur popular in Tuscany and other regions. That liqueur is then used to dye food too, cake or lady fingers are often soaked in it. The Italian version of a Trifle, the ‘Zuppa Inglese’ is made with sponge cakes or lady fingers soaked in Alchermes. See below a period recipe from Mr. Borella, who was the head confectioner to the Spanish Ambassador in England around 1772. He also uses Cochineal to colour his quince cheese. To make the paste of a fine red, bake the quinces in the oven a long while, then peel and sift them in a strong hair-sieve; dry the marmalade over a slow fire a little while, to about half the consistency of a paste then to redden it the more, keep it a good while on a slow ashes-fire, stirring some time; and to add to this redness, put a little steeped cochineal, and reduce it on a flow fire, to a thick paste; that is, when it loosens from the Pan; put as much sugar as marmalade, or paste, soak it a little while on the fire and let it cool, just enough to work it well with the hands, and finish directly as usual. The recipe below can be used two ways. You either jar the jam before it goes into the oven to dry and use it as a filling for pies (see the next posting), or you place it into the oven so it becomes fruit cheese. 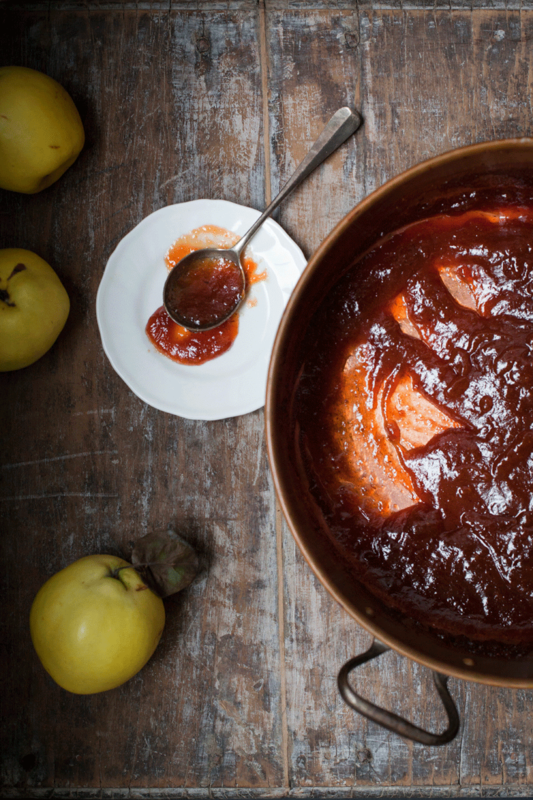 The trick to get a beautiful dark colour is to cook the quince and the jam slowly and for a long time. The peel I’m told is also adding to the reddish colour so I never peel the fruit. 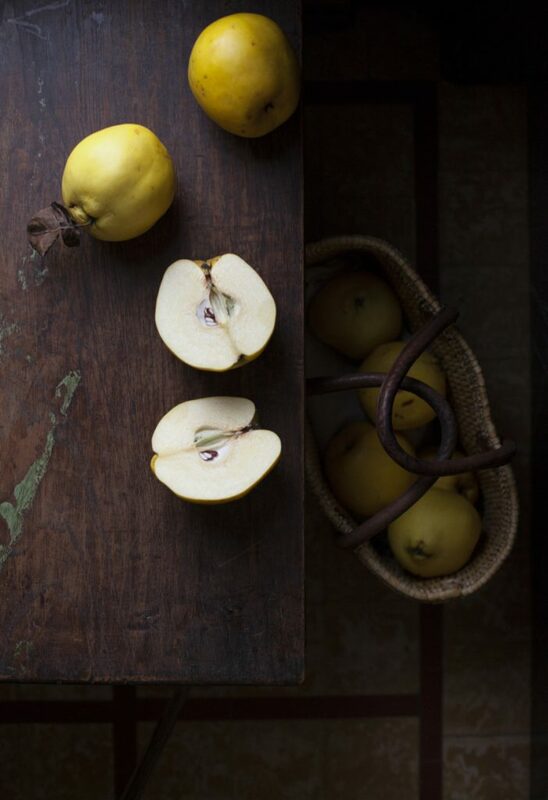 In a large saucepan cover the quinces with water and boil until tender with the spices. Remove the quinces from the saucepan and save the spices. Blend to a puree using a stick blender. 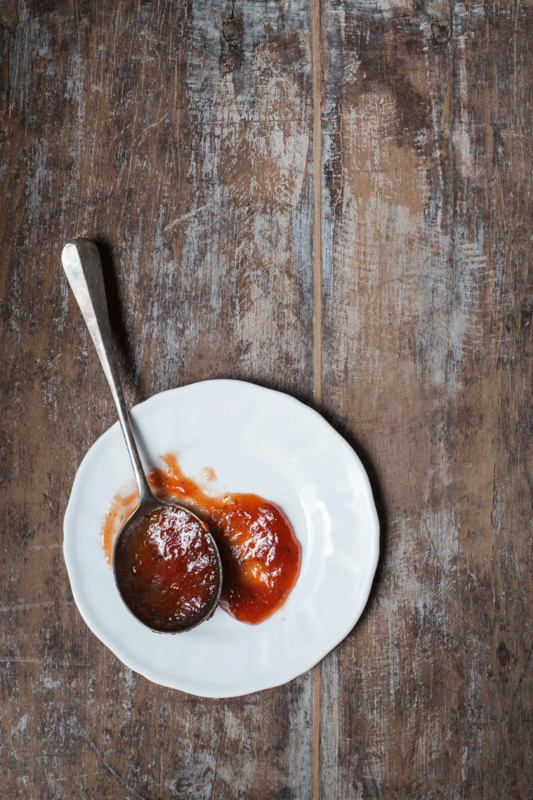 Measure the quince puree and add the same weight in sugar plus the spices you saved. Proceed as for making jam, being careful as quince jam tends to spit. A way around this is to not make the jam on a hob but first bring it to a boil and stir for 5 minutes, remove the spices, then transfer the pan covered in greasproof paper into the oven at 160°C. Leave there for 45 minutes, then check on it, it should be thick and perfect for a pie filling. If you see any woody bits in your puree, I would advise to strain it through a sieve. Then proceed to dry the fruit cheese by preheating your oven to 160°C if you haven’t already. Transfer the jam to a tray which you previously lined with greaseproof paper. You can make it as thick if you want but 1 cm is definitely the minimum. Let the paste dry until you feel it is becoming firm. There is no saying how long this will take exactly but it will be around an hour at least for sure. When ready, leave to cool and then wrap in clean greaseproof paper. Place in an airtight container and it will keep for a few months. It might cristalise a little, but that doesn’t make it bad to eat. You want it super red? You might have a hard time finding the cochineal beetles but you can use all natural red beetroot powder! This is nice as an edible gift to someone special! Quince tart Coming next week!